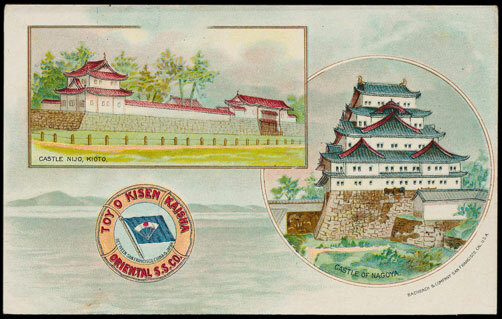 The foreign section of the Warwick and Warwick sale held on July 20 included a further section of the fabulous collection of Japanese art cards assembled by the late Karl Jaeger. Six collections were on offer, estimated in total at £2,180. The final total realisation was an impressive £5,764. 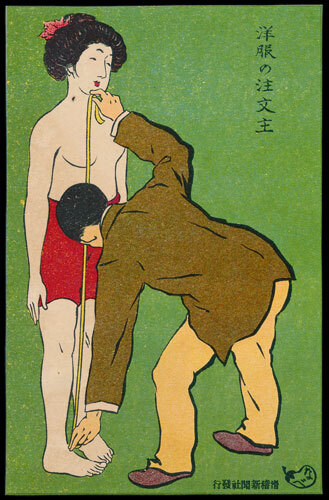 One of these collections consisted of 210 comic and art cards which appeared in the satirical magazine Kokkei Shimbun from 1907 to 1909. This collection made £1,829 (£8.71 per card). Another country selling well was Switzerland, where a collection of towns and villages, arranged alphabetically, in 12 lever-arch files, comprising around 4,000 cards, made £3,304. By contrast, 3 collections of French printed topos were unsold, despite modest estimates and modest reserves. In the British topos, Warwickshire was represented by 5 collections and these were well competed for by local room bidders. The collections were rich in village cards and contained many RPs of churches. In total 2,440 cards were on offer, estimated at £1,320 and they realised £2,448. The miscellaneous collections section included lot 3, a dealer’s stock of 2,400 subject cards, contained in 2 dealer’s cases. Many subjects were present, including comics, topo art, Father Christmas, glamour, adverts, aviation and the lot bore at estimate of £380. After hectic bidding the hammer finally fell and the buyer paid £1,062, including the buyer’s premium. The market for British artist-drawn cards is still lukewarm, especially for Louis Wain. Condition is critical for ensuring a good result. In military art, 96 different Gale & Polden military crests made £236 (£2.46 each). The 5 collections of railways on offer all sold for figures in excess of estimate, which augers well for the next Warwick and Warwick sale, on September 21, which contains a large section of railways. 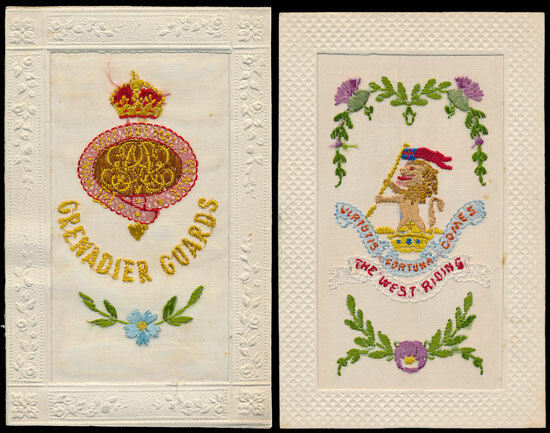 Silks sold well and a collection of 129 embroidered silks, which included a “Grenadier Guards”, estimated at £500, made £1,032. 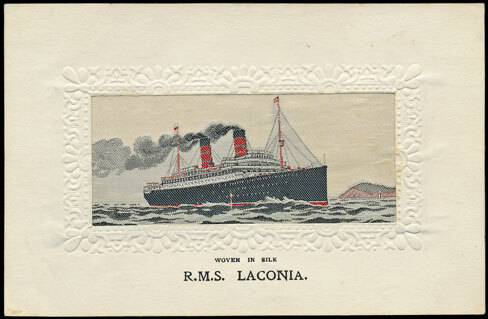 “The West Riding” embroidered silk made £54 and a woven silk of RMS “Laconia” made £45.